Home | Budget Basics: Who Pays Taxes? The fairness of our federal tax system is a hotly debated issue. Too often, however, those debates confuse or misrepresent important facts because they focus on one type of tax in isolation rather than the various taxes that people face in aggregate. Using data from the Tax Policy Center (TPC) and the Congressional Budget Office (CBO), we can examine the broader federal tax system. Payroll taxes, which help to finance Social Security, Medicare, and unemployment benefits, are the second-largest source of federal revenues, and make up about one-third of total receipts annually. Payroll taxes are deducted from workers’ paychecks through a line item called FICA, which stands for the Federal Insurance Contributions Act. The government also collects taxes on the profits of corporations. In 2018, most corporate income was taxed at 21 percent at the federal level. Excise taxes are indirect levies upon transactions of particular goods or activities, such as gasoline, alcohol, or gambling. Estates over a certain threshold ($11.18 million in 2018) are subject to federal taxes, and individuals who give large gifts of property (including money) to other individuals may also be subject to a gift tax. In 2018, the threshold for gifts was $15,000. 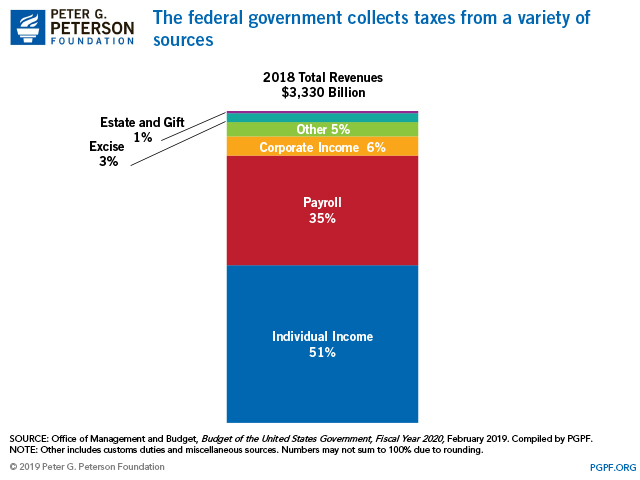 While nearly all Americans pay taxes, the composition of the type of taxes paid is very different for taxpayers at various points in the income distribution. Affluent Americans pay a larger share of their income in individual income taxes, corporate taxes, and estate taxes than do lower-income groups.1 By contrast, lower-income groups owe a greater portion of their earnings for payroll and excise taxes than those who are better off. In fact, taxpayers whose incomes are in the bottom 90 percent of all incomes pay, on average, more in payroll taxes than in income taxes. 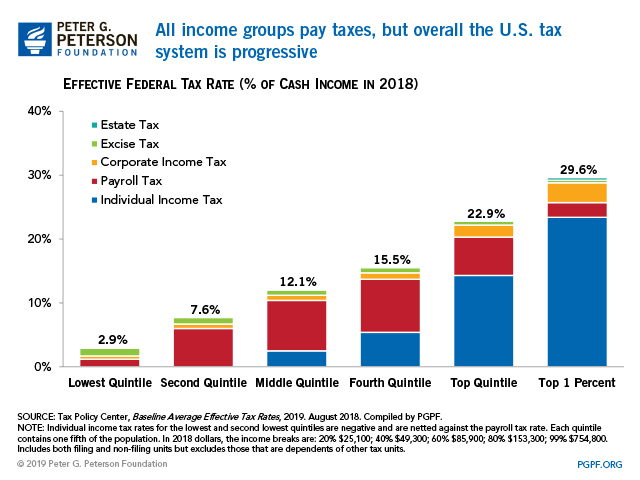 In the aggregate, the U.S. tax code remains progressive — with higher-income taxpayers paying a larger share of their income in taxes. This is true despite the fact that high-income Americans benefit disproportionately from tax breaks, otherwise known as tax expenditures. Major tax expenditures — such as lower rates on capital gains and dividends, deductions for charitable contributions, and deductions for state and local taxes — do tend to benefit high income taxpayers more than lower-income groups. CBO estimates that the top quintile of taxpayers receive 51 percent of the value of major tax expenditures, while only 8 percent goes to the bottom quintile. However, even with substantial tax expenditures, the top one percent of American taxpayers still pay an effective tax rate of 30 percent, on average, while the bottom 20 percent of the population pays an average of 3 percent. 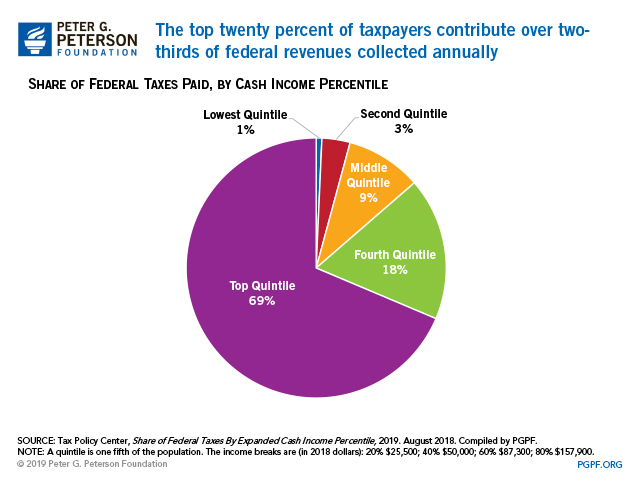 TPC estimates that 69 percent of taxes collected for 2019 will come from those in the top quintile, or those earning an income above $157,900 annually. Within this group, the top one percent of income earners — those earning more than $783,300 in income per year — will contribute over a quarter of all federal revenues collected. While the fairness of the tax system is much debated, many economists agree that simplifying the tax code would help the economy. Further tax reform could promote economic growth, while also making the code more simple, transparent, and fair. 1 The corporate income tax affects individuals by reducing wages and returns to capital. Based on economic research, TPC attributes 80% of the corporate-tax burden to capital and 20% to wages and other sources of labor income.